Whether you're cooking with the fam or partying for the New Year, we got a dress for you. 1. A jaw-dropping fit and flare for making a ~dramatic~ entrance. 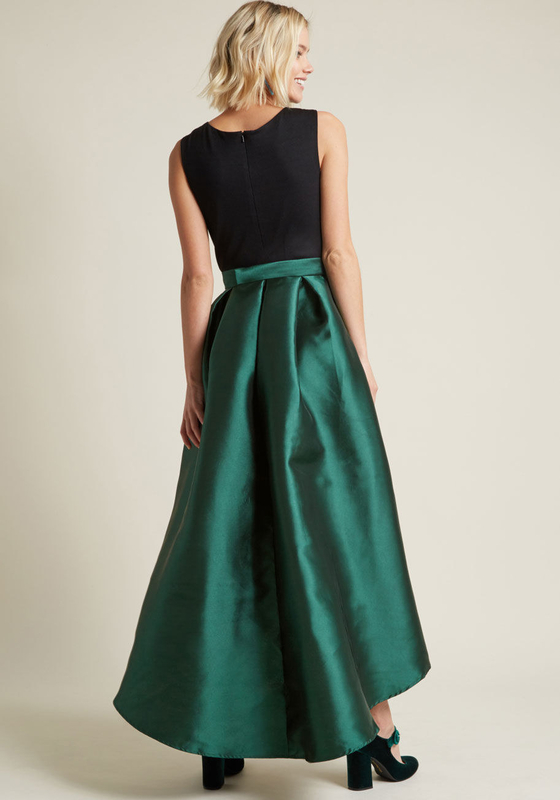 Get it from Modcloth for $129 (available in sizes 2–10). 2. 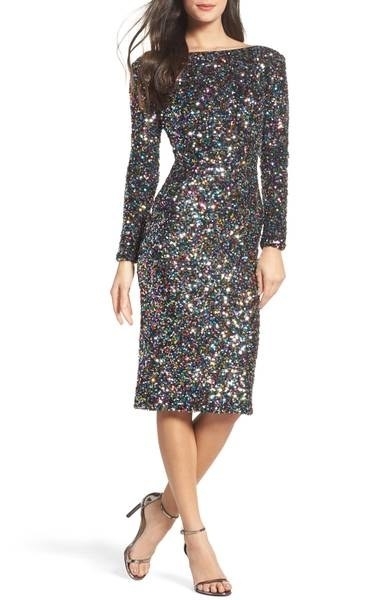 An ombre glitter dress that will make you look (g)radiant. Get it from Macy's for $109 (available in sizes 6–16). 3. An floral embroidered wonder for a unique holiday style. 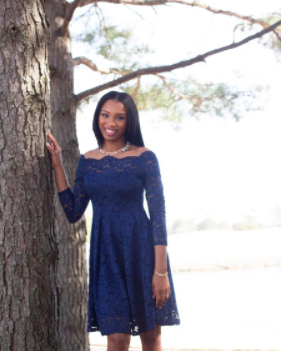 Promising review: "This dress is phenomenal. 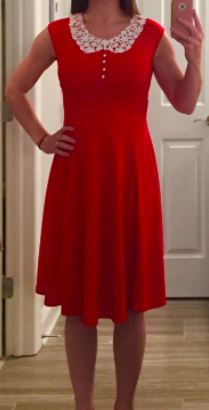 I was shopping for a company Christmas party and this was perfect. 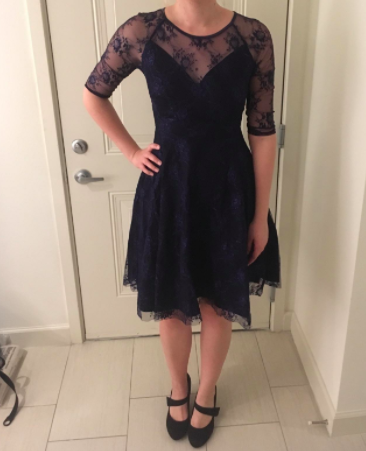 I intentionally didn't post pictures on social media because the dress is so unique that I want to be able to wear it to another big event as soon as humanly possible. 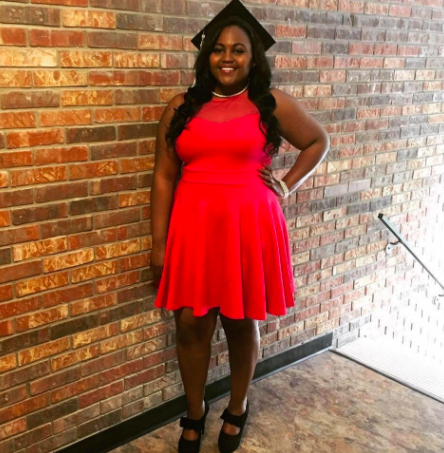 I got lots of compliments and questions as to where I found it from all ages and genders (and absolutely felt like the belle of the ball)." —Zora F.
Get it from Amazon for $39.99+ (available in sizes 0–8). 4. A metallic, asymmetrical dress you'll really take a shine to. Get it from Express for $54 (available in sizes XS–L). 5. An open-backed glitter dress as opulent as any Great Gatsby party. Get it from Rainbow for $19.97 (available in sizes S–L and plus sizes 0X–3X). 6. A lacy number you won't be able to stop swirling in. Get it from Amazon for $39.99 (available in sizes XS–XXL and four styles). 7. 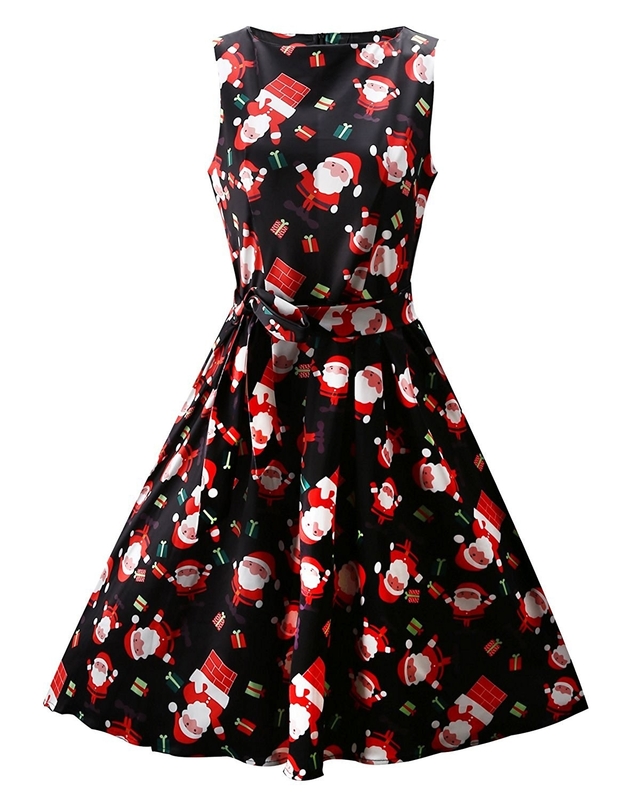 A Santa-covered frock that would be mistle-take to not buy. Get it from Amazon for $15.99+ (available in sizes S–XXL and children's sizes 7–11; also available in seven patterns). 8. A pearl-embellished frock you'll look clam fine in. Get it from Asos for $108 (available in plus sizes 12–24). 9. 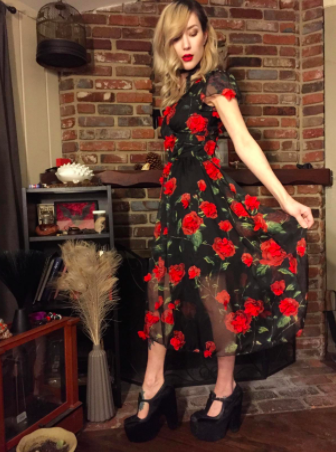 A rose-applique dress so you can wear your own personal garden. 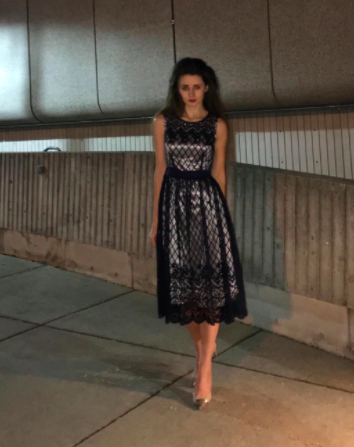 Promising review: "This dress is beautiful in motion and is the perfect bohemian date night outfit (I wore it out for a night dancing and completely fell in love)." —Zora F.
Get it from Amazon for $35.99+ (available in sizes XS–XL). 10. 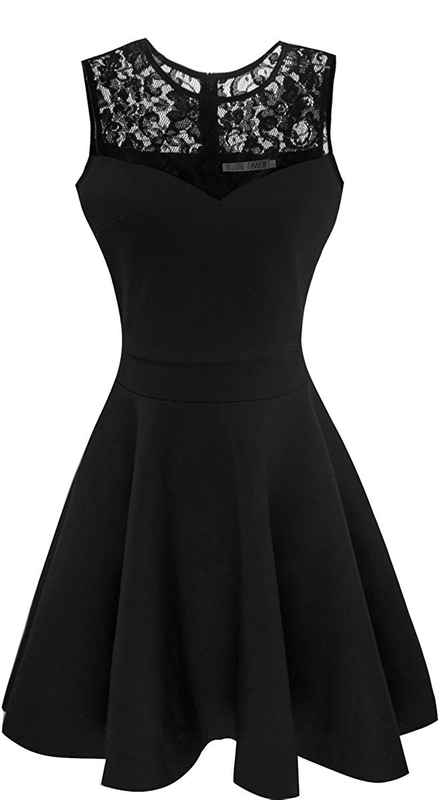 A classic skater dress with some off-the-shoulder action. Get it from Boohoo for $12.50 (available in sizes 2–12 and four colors). 11. A lacy bodycon so beautiful, you'll want to wear it year round. Get it from Amazon for $21.99+ (available in sizes S–XL and six colors). 12. 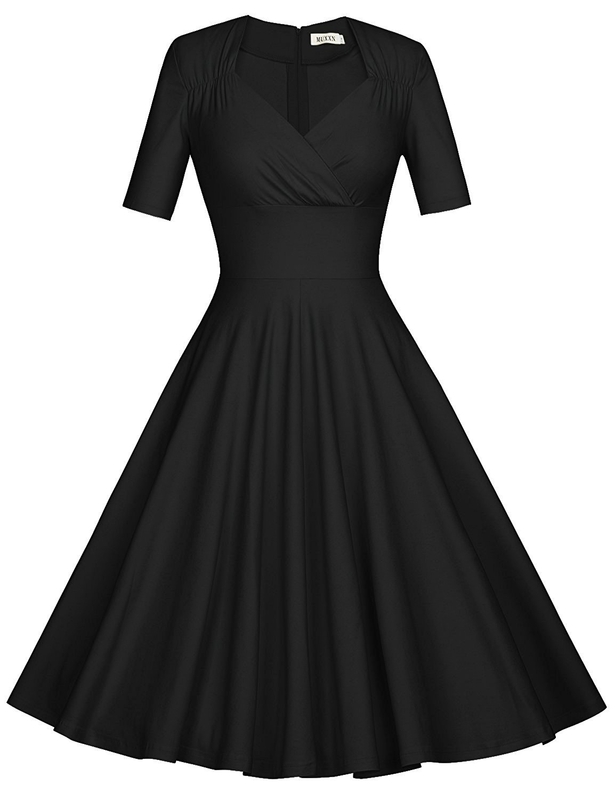 A velvet keyhole skater dress glamorous enough to wear to any holiday after-party. Get it from Rainbow for $16.97 (available in sizes S–L and two colors). 13. 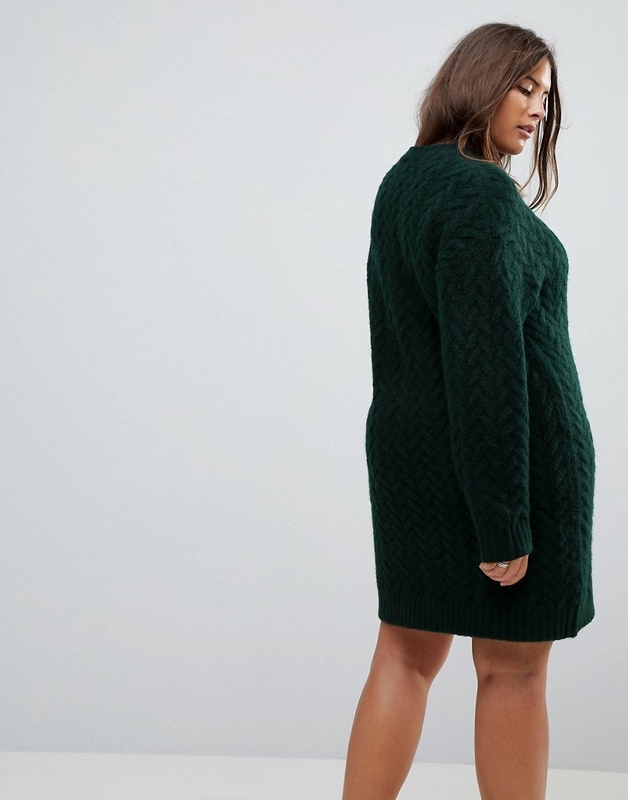 A forest green sweater dress perfect to wear while snuggling up with a fire. Get it from Asos for $56 (available in plus sizes 14–20). 14. An elegant, sparkly maxi for attending swankier events (or just being the best dressed person at your grandma's house). Get it from Free People for $98 (available in sizes XS–L). 15. A festive skater dress covered in wreaths and kittens — what's not to like? 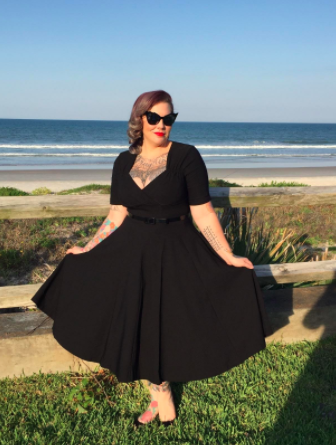 Get it from Modcloth or Jet for $79 (available in sizes XS–4XL). 16. 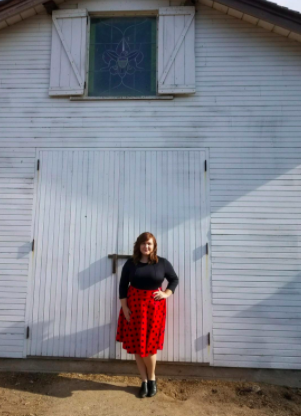 A plaid swing dress perfect for attending your next lumberjack ball. Get it from Amazon for $21.98+ (available in sizes S–XL and four patterns). 17. 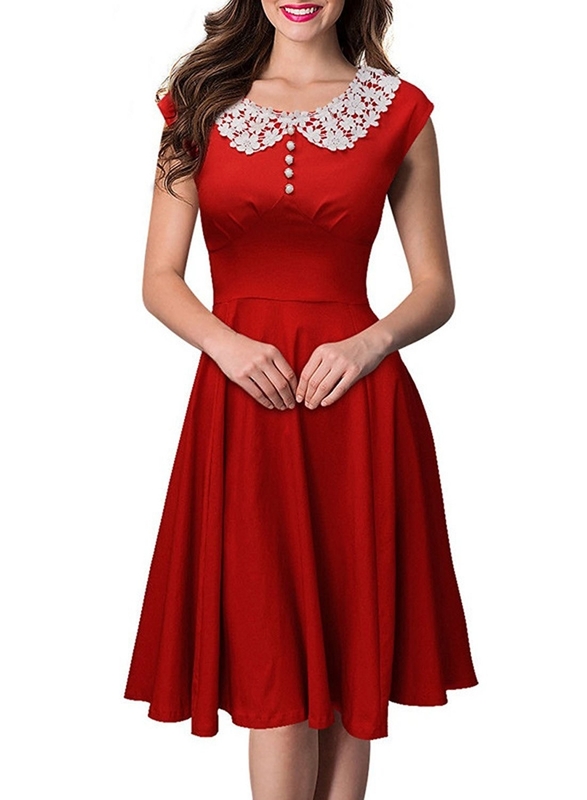 A v-necked frock with fun, tiered sleeves. 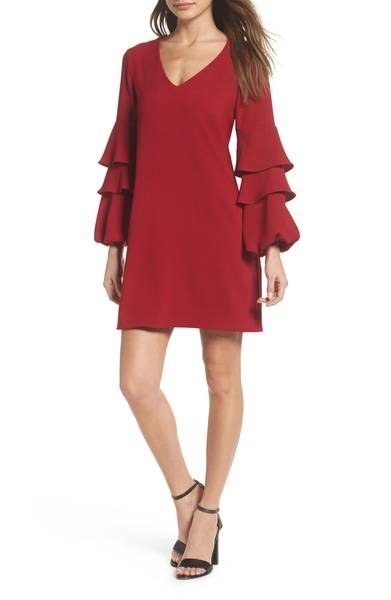 Get it from Nordstrom for $98 (available in sizes XS–XL and two colors). 18. 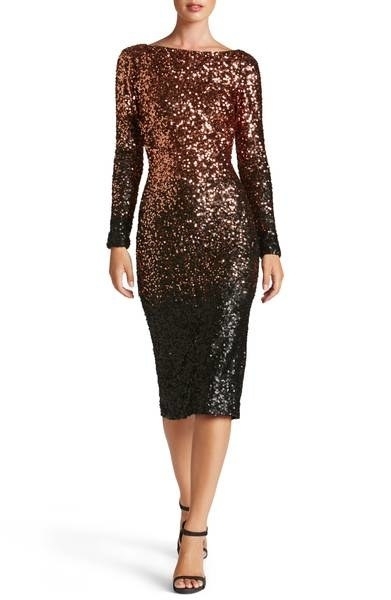 A velvet sequin dress for anyone who loves being the center of attention. Get it from Free People for $128 (available in sizes XS–L). 19. A fancy fit and flare with mesh neckline that'll impress the whole family. Get it from Amazon for $37.99 (available in sizes S–XXL). 20. A sparkly geometric number as glittery as the champagne you'll be drinking. Get it from Express for $59 (available in sizes XS–L). 21. 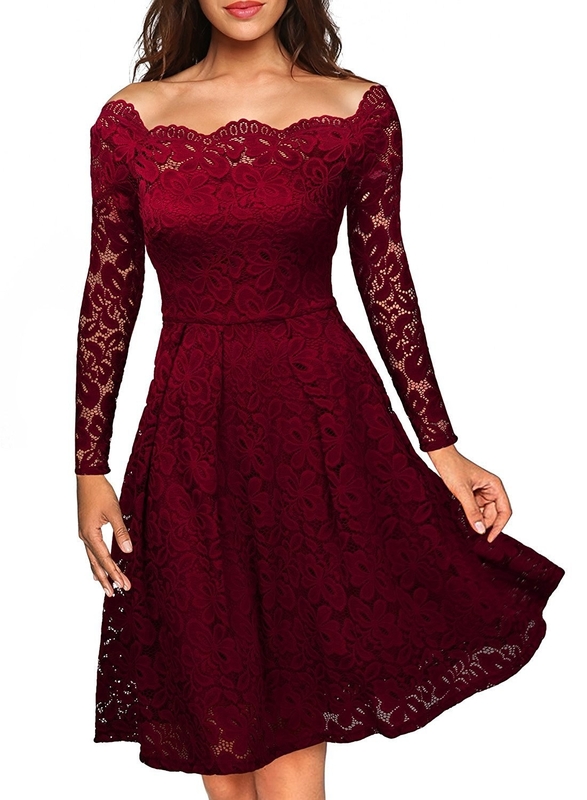 A velvet brocade A-line with a mesh neckline for looking really elfing good. 22. A glittery number inspired by all the confetti you're about to be dancing in. 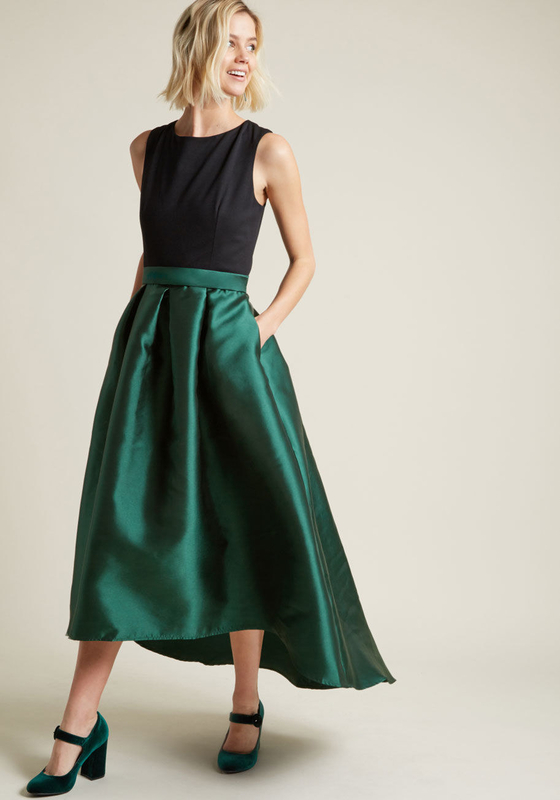 Get it from Nordstrom for $260 (available in sizes XS–XL and five colors). 23. A sparkling, backless frock to wear while toasting the New Year. Get it from Boohoo for $34.50 (available in sizes 4–10). 24. 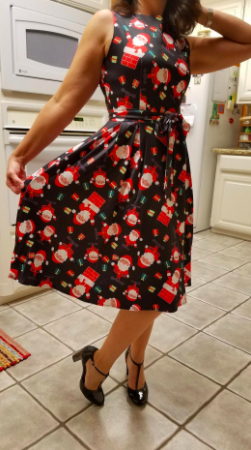 A vintage-style swing dress for listening to old-school holiday tunes in. Get it from Amazon for $19.99+ (available in sizes XS–XXL and 11 colors). 25. 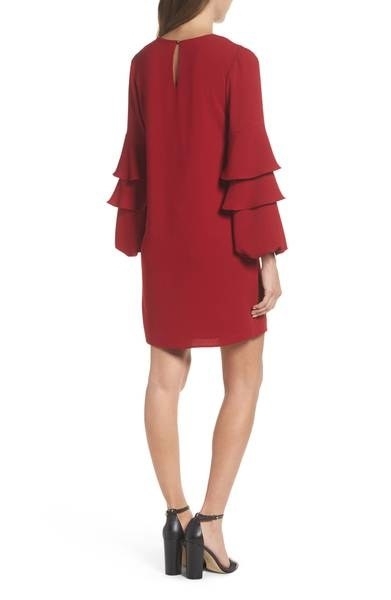 A cape dress that's putting out some Little Red Riding Hood vibes. 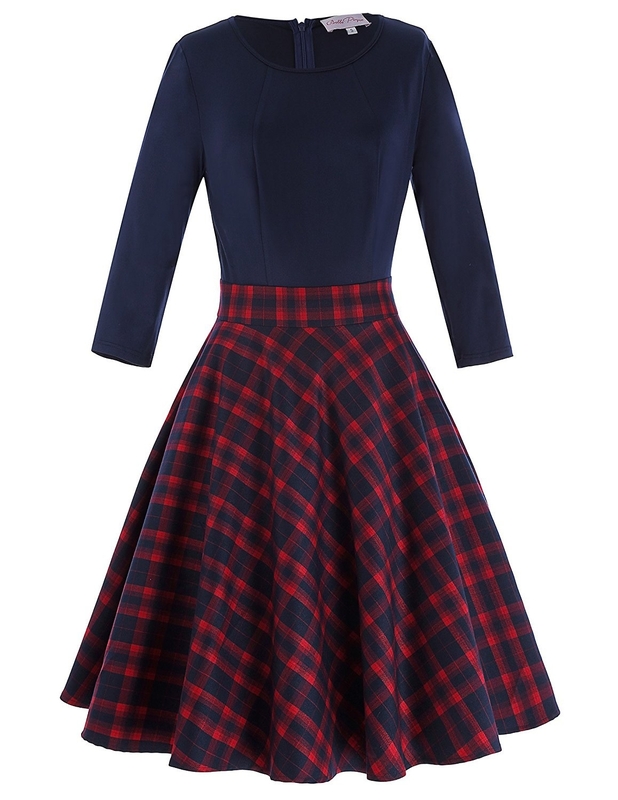 Get it from Modcloth for $99 (available in sizes XS–XL and two colors). 26. A mesh bodycon dress for watching the ball drop in style. Get it from Rainbow for $19.97 (available in sizes S–L and two colors). 27. A sheer dress to layer with any holiday accessories you get in your stocking. Get it from Forever 21 for $28 (available in sizes small or medium and three colors). 28. A tassel-covered frock perfect for shaking it on the dance floor. Get it from Boohoo for $39.50 (available in sizes 2–6). 29. A retro darling with floral Peter Pan collar that will make you happy enough to fly. Get it from Amazon for $15.99+ (available in sizes S–XXL and five colors). 30. 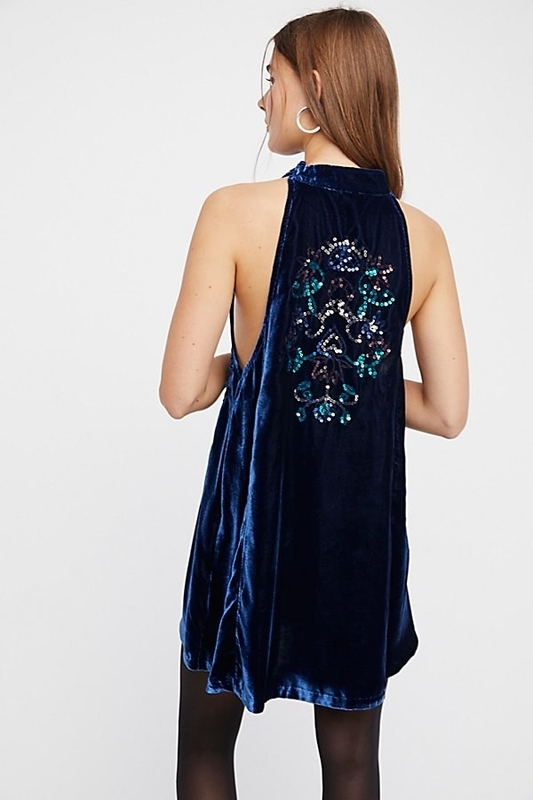 A sleeveless, velvet number for getting into the most exclusive clubs in the North Pole. Get it from Boohoo for $10 (available in plus sizes 12–20 and two colors). 31. 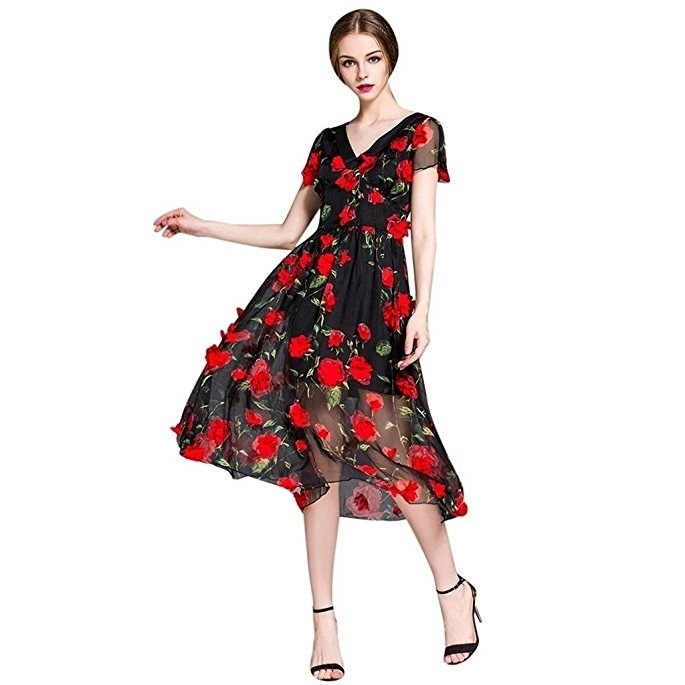 A velvet dress with fun floral sleeves that looks so fire, it rivals the yule log. Get it from Forever 21 for $58 (available in plus sizes 1X–3X). 32. An A-line with lace neckline for an outfit that will really sleigh. Get it from Amazon for $17.99+ (available in sizes XS–XXL and 39 styles). 33. A crushed velvet stunner with a surprising black ribboned back. Get it from Boohoo for $19 (available in sizes 4–10 and three colors). 34. 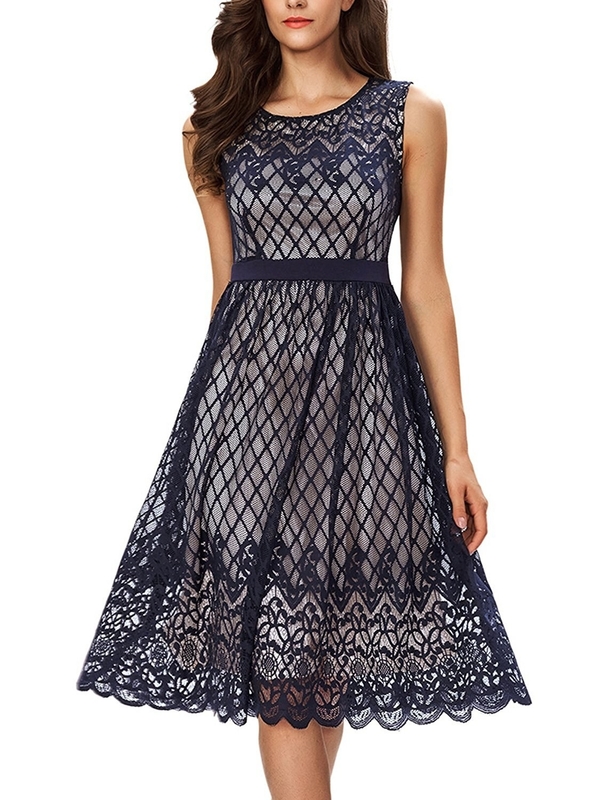 A lacy swing dress that will look even better when you accessorize with a cup of eggnog. Get it from Amazon for $33.99+ (available in sizes S–XXL and two colors). 35. 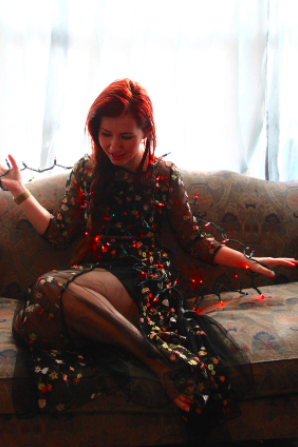 A jawbreaking ode to sequins sure to catch the attention of everyone. Get it from Boohoo for $70 (available in sizes 6–10). 36. 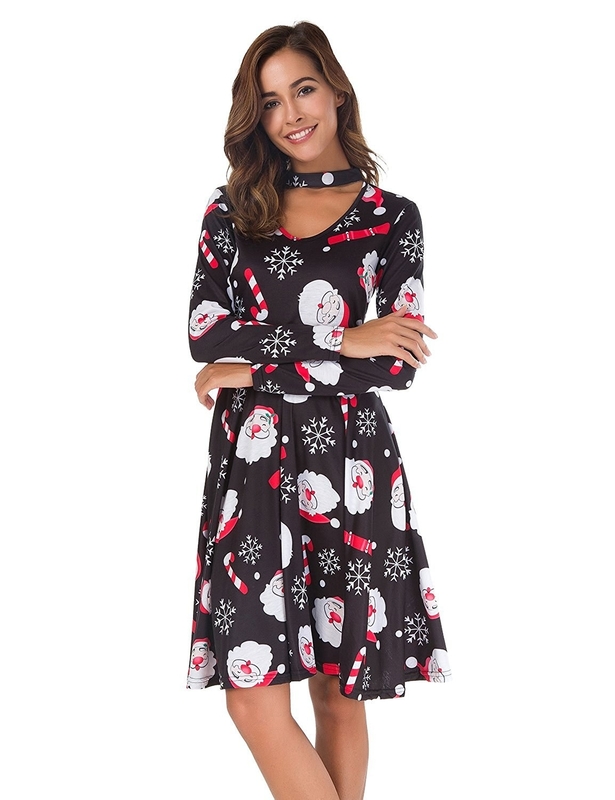 And a more relaxed, stretchy dress with a built-in choker and a festive pattern. Get it from Amazon for $9.99 (available in sizes S–XXL and four patterns).